Brian Sussman joins the Holistic Survival show to talk to Jason about his latest documentary with Frank Pinski about how climate change is a scam. Brian has written books such as ClimateGate and Eco-Tyranny and he is also a former meteorologist. Brian talks to Jason about how Vladimir Lenin was an environmentalist, your carbon footprint has become the new religion, a little bit about the documentary It’s Easy Being Green When You Have No Choice, and much more on today’s episode. 2:20 – What’s the debate here? Is global warming really happening? 6:40 – Why did Nixon setup the Environment Protection Agency if he was a republican? 14:20 – Jason talks about how concrete absorbs heat and how that might affect climate calculations when in bigger cities. 15:00 – Is global warming really all that bad? 21:45 – Will we one day view dictators as environmental heroes? 24:45 – Environmental regulations don’t hurt people like Al Gore, they hurt the poor. 27:05 – Do your research with an open mind and find the truth. 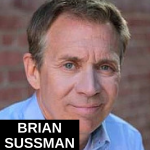 It’s my pleasure to welcome Brian Sussman to the show. He is an award-winning science reporter and meteorologist. He’s a talk radio host, creator of the new documentary, It’s Easy Being Green When You Have No Choice: Sustainable Development and the End of History and he’s the author of Eco-Tyranny: How the Left’s Green Agenda will Dismantle America and Climategate: A Veteran Meteorologist Exposes the Global Warming Scam. Brian, welcome, how are you? Jason, great to be with you and your audience. Thanks for the opportunity. It’s good to have you. You know, this topic is so controversial, it’s like discussing religion. I mean, it’s ridiculous same of the debates that I’ve had and seen people have on this issue. By the way, on your website, I guess, you’re challenging Al Gore to a debate. I’m wondering if he ever respond? No, I’ve actually the URL DebateMeAlGore.com actually directs back to some of my websites. He’s never taken me up on the opportunity. It’s interesting, to his credit, he’s never blocked me from being a Twitter follower, so that’s kind of interesting, but he’s never debated me. People like Al Gore, they like friendly media. They have plenty of that at their disposal. What’s the debate here? Is global warming happening? I mean, they conveniently changed their name from global warming to climate change as if the climate has never changed. You know, there have been many books written about the topic obviously, you’ve certainty discuss this a lot and you’ve got a great reputation as being a very reasonable guy when it comes to your arguments. I wrote the book Climategate as you mentioned, which there, again, I’m just one of many voices, but Climategate I’m told was a significant voice in making sure Nancy Pelosi’s cap and trade bill didn’t pass in 2010 and Nancy Pelosi, of course, i my congress woman. You’re in San Francisco, right? I am in San Francisco. Eco-Tyranny then came about in 2012 and my goal with Eco-Tyranny was to just show the whole agenda. So, we’ve talked about global warming and I really tried to dismiss that as a myth and climate change as you know they’ve conveniently changed the name from global warming to climate change, because they haven’t seen a lot of global warming and I’m talking about since, you know, 1850, the beginning of the industrial revolution, one thing I really find interesting, Jason, is since 1850, beginning of the industrial revolution and really an end of a period that lased 100 of years called the little ice age, the temperature of the earth has only, this is not disputed even by those like Al Gore, the temperature is only warmed .7 degrees Celsius since 1850. Now, the hottest decade on record, again, you can’t dispute this either, Al Gore would have a tough time with this one, the hottest decade on record were the 1930s. 88% of the warming that’s been experienced on this planet since we came out of the little ice age in 1850, 88% of the warming occurred before 1940. There’s been absolutely no warming for about the last 18 years. The temperature has been flat, but what they’re doing and we talk about this in the film It’s Easy Being Green When You Have No Choice, they’re manipulating the data to make it apparently read warmer, so the broader question, Jason, is why are they doing this? And that’s what we really get into in this film. It’s been said that green trees have red roots. Tell us about the Soviet Union and the green movement. This is what I learned in Eco-Tyranny, by the way, the director and producer of this film is a guy named Frank Pinski and Frank is a delightful guy from New Jersey. He contacted me out here in the left coast and said, “Hey, would you be my narrator?” I said, “Listen, take whatever you want from my books. I’m all for ya. Hey, I’ll be your narrator. I don’t want a dime for that. I just want to help you and your efforts.” So, Frank and I both, Frank found some jaw droppers for the film, but what I learned in my book Eco-Tyranny is I was researching, if you go back to, well, Vladimir Lenin. Vladimir Lenin was a disciple of Karl Marx. This guy learned at the feet of Marx. He ate up everything Marx ever wrote and was just a veracious student of Marx. Vladimir Lenin was the original green goblin. I mean, this guy, he wrote books called On Land and On Forest. He talked about the minerals and he talked about the national resources. He believed that no person had the right to own any thing that had to do with our land, our water, our natural resources, etc. He was an environmentalist before there were any environmentalists. He thought, Jason, that mankind was an invasive species. So, he wrote all these detailed, detailed papers. It’s as if now the Environmental Protection Agency, the Department of Fish and Wildlife, all of our organizations having to do with land and environment here in the United States as well as the United Nations. It’s as if they looked at everything that he wrote, I believe he did, and they’re not trying to trying to implement that here in the United States and all over the world. Their marching right from his playbook. I don’t know why this is such a left/right debate in the first place, really. You know, the Environmental Protection Agency, the EPA, the biggest of all environmental agencies was setup by a republican, Nixon. I mean, you know, why would Nixon would want that if, you know, let’s just disect that one real quickly if you would. Nixon was, you know, like many republicans he was a guy that didn’t have a problem with big government. He was a guy that thought, you know, big government works if we can manage it properly and setting up the Environmental Protection Agency he was doing two things. One, of course this was the early 70s, you had the whole hippy movement which really had a powerful voice. So, it was anti-Vietnam, anti-establishment, anti-the-man, don’t trust the government. So, on the one hand, this was an appeasement to these people who were really starting to see the whole going back to nature movement as being something that was very real to them. So, it was an olive branch to the peacenixs and the hippies, etc, but at the same time, it was a way to make the government a little bigger and perhaps he thought more efficient as well. Did he know what was going to end up happening with the Environmental Protection Agency at the end of the day? I’m not so sure, but keep in mind this was also at a time where we were about to have the first Earth Day in 1970, so there’s a lot of stuff going on that had to with the environment and I think it was Nixon’s way of becoming a more popular President and certainty that was very important to him. Go on with what you were going to say though, the Soviet Union and, you know, this stuff. I don’t know if you finished that thought. Yeah, so Vladimir Lenin, I mean, listen, his papers and I’ve read them, were very well written and his arguments very, very powerful in that humans are the invasive species, humans left to their own devices are going to ruin the earth, human left to their own devices will kill one another, thus let’s implement what Marx wanted; a heavy handed form of government with lots of regulation, so we can keep control of the people and so we can maintain control of the natural resources. Let me just make a comment about that. I mean, certainty, if anybody has rented a car before or rented anything, they will agree that the way to get someone to take care of something is to have the moment, because always want to take care of their own property more than they want to take care of, you know, common property or public property. Were the socialists and the communists environmentalists? I mean, it had to be strictly away of control. It couldn’t have been for the environment, because I mean, I remember years ago picking up a Green Peace magazine after the Soviet Union fell and looking at all the incredible environmental destruction in the Soviet Union. I mean, they are the worst environmental stewards of all or at least, they were under the prior system. Lenin didn’t have an opportunity to implement what he so desired, but what’s really at the heart of this. This is what we try to do in the film and by the way it’s easy to get a look at a trailer or even purchase the film just by going to GreenFlick.com, but beyond that, so in this film, we really show that this, this socialists, the communists, the elitists, the one-worlders; the people who really have an Utopian plan for this planet. So, Gorbachev, you know, when he, you just mentioned the red/green analogy, Gorbachev, when the Soviet Union fell, immediately he became this rabid environmentalist. In fact, he setup shop here in San Francisco, Nancy Pelosi gave him a beautiful piece of property that used to be former military land overlooking the Golden Gate Bridge. That’s where he established his Green Cross. So, he sees this environmental movement as being his best shot at, again, spreading socialism or in his particular case, communism to the world, because he hasn’t changed his stripes at all. They’re just hypocritical in so many ways. So, this is really where you see these elitists going. These are the people who look down on the rest of just sort of being fools that need to be minded with heavy controls. I believe that’s where this whole thing is going and it’s really not about global warming. Something else we talk about, Jason, in this film to make the point that it’s not really about the science, there’s something that’s being taught at schools and research centers all over the world called post-normal science. In other words, we don’t need the scientific method any longer if we just test our theories in a computer model, that’s as good as the real world. That’s what they’re doing to come up with all of these crazy theories that they’re treating as if they’re law. Post-normal. Why do they get a name like that? Yeah, that’s interesting, because we’ve all heard of post-modern and they’re very proud of this post-normal science and they have no problem with it and you can see how it’s easily adaptable to, for example, the younger generation and I love what’s happening in the world of technology, you know, living here in the Silicon Valley, I love how the younger people are so adept with technology, it’s wonderful, but at the same time, people are living inside their computer, Facebook. There’s more to the world than computer scenes, yeah. But a lot of people are living inside their computer and the computer scenes and the computer games that they’re playing, etc, etc. So, now they go to college, they’re learning about programing and there’s this virtual world inside of a computer and they can manipulate it, have fun with it, so when it comes to the atmosphere, for example, you know, does it really matter about what the temperature is really reading around the world? I’ve got this computer model and it’s pretty slick and it tells me if we increase carbon dioxide by this much, this is going to happen. I like this model. Well, there are so many questions as to whether the temperature really is raising. For example, it’s where they take the temperature. A lot of these weather stations in these cities, you know, they’re sounded by concrete and concrete just absorbs and reflect heat. I mean, it just keeps it so long. I remember when summer a few years back, I was in Romania, I was in Bucharest, and I couldn’t believe it. It’s like it never got cool, because at night, all that concrete, it’s just a concrete jungle, that’s what the residences explained to me, it just kept the heat, you know? When it’s a less developed area and you put the weather station in a grassy nole, so to speak, it just registers a cooler temperature. That’s just one of so many factors that is going on. You know, one of the bigger questions I think people should be asking is, let’s assume they’re right. Let’s assume the left is right and global warming really is happening, I think the next question any intellectually honest person has to ask is, is it bad? It means bad things to some and really good things to others. I mean, a lot of people in certainty areas of the earth would love to see temperature raises. It would create airable land, it would be a much easier way to live, it would increase fertility and crop turn outs. Is it bad? You answered the questioned very well. All of the research would suggest that a warmer climate would be beneficially to most people. You know, you just look here in the United States as we’re seeing, for example, our live span increase in the United States. You can look at a lot of that, perhaps having to do with the fact that people from the colder and more harsh climates are tending to now popular the Southern United States and the South Western United States and those climates are allowing, you’re seeing the age increases as they move to these warmer climates. That’s just one little example, but airable land is certainty a big factor. Increases in carbon dioxide. We know that’s beneficial to life in that, one, life depends on carbon dioxide, but just look at our green houses. The green houses in the United States of American who are growing so many wonderful things are all enhanced by an increase in CO2 to the tune of 3-4-5-6 times the amounts normally found in the atmosphere and there’s been some great research I’ve discussed from the University of Michigan just proving how CO2 is a stimulant to crop growth. Of course it is, we were all taught that the plants breathe in CO2. I mean, don’t the tree hugers love trees? Trees breathe CO2. Don’t they want them to have their version of oxygen? Look what’s happened, CO2 has been demonized as a pollutant when in fact it’s a fertilizer. I mean, that’s one argument I’ve never understood. No global warming believer has ever been able to explain to me. You know, at first, when I didn’t know a lot about the subject, I thought that they were all complaining and upset about carbon monoxide that comes out of your tail pipe, but what they’re really concerned about is carbon dioxide that comes out of your mouth. So, basically the only logically conclusion is to reduce population and if we’re going to population, who gets to decide who gets to live and die or who gets to procreate and who doesn’t? I suppose the elites do, right? That is something we address in It’s Easy Being Green When You Have No Choice, because think about this, you now have a crop of kids coming out of college. They have been told that carbon dioxide is bad ever since they were in kindergarten an now they’re graduating from a college and universities and they thought is, well, if I get married, I think it’s best that I don’t have children. If I have children, I’ll just have one. They’re all concerned about their carbon footprint, because it’s been engrained in them that the carbon footprint is bad. To them, you started out the discussion talking about this being like religion, to the younger generation, this has become their religion, their void of a traditional religion in so many cases, but this is a wonderful religion with a system of works and system of reward and a system of perceived benefits and a system of feeling good for doing what they consider to be the right thing. So, this is religion for them. The fact is they all consume. I mean, I don’t see any of them ending their own lives, yet really ultimate, I mean, it sounds terrible to say, but the other conclusion this stuff leads to is a dictator exterminating people. When are we start hearing, I mean, the world is so f-ed up nowadays and was is expected as truth is so absurd. I mean, this may sound like a nutty thing I’m about to say, I just want you to understand, okay, but there will be a day if we keep going down this direction where people the likes of Bin Laden and ISIS and the next crazy wacko that does a murder/suicide is going to be revered as an environmental hero. Yes, this is where it’s going and you can see how it sounds like something out of Brave New World. Now, they’ll come a time if we just go down this road and look at one of the current discussions. The current discussions are you having the ability to end your life. You know, the right to die movement. So, there could come a die in the United States of America that’s red, white, and green where the patriotic thing to do on behalf of society, you know, the better men of society, is to make sure that your carbon footprint does not last longer than is necessary and at the appropriate time you will take the correct pill and all of your family will be around you and you will say good bye and it will be a celebration of life, because you are doing the unselfish thing. I really believe left unchecked that’s where we’re going. I mean, haven’t they proven that this Malthusian stupidity is just outmoded idea? Why is that they all consider people to be this burden on poor earth like we’re just these evil people here to destroy the earth. We’re the ones that come up with the solutions too. Granted, we do create the problem first, but if we didn’t do that, we wouldn’t think of a solution or a reason to solve it. Guess what else folks? All those solutions come from capitalists. They come from people who are those greedy, evil capitalists who want to earn a profit by solving a problem. Imagine that. And now you come full circle. I mean, you see this sustainable development, which is what we talked about is nothing more than a tool inspired by these Marx’s ideals to indoctrinate us to accept a highly control society in which everyone is monitored in the name of persevering the planet. Boom. There you go. It’s just a funny disconcerting and really scary form of thinking. I mean, that’s ultimately where it has to lead. It really does. I mean, they’ve revised history so many times now. Will they look back and say Stalin, Hitler, Pol Pot, what about Che Guevara, their hero, right? Will they say they were environmental heroes? Yeah, so you look at, you won’t even look at how many were killed as a result of their ideology, you’re going to look at how, you know, they were heroes of the environment and overall bettered this environment, natural resources, preserve them, all species saved, etc. So, again, this the road we’re going down and these are many of the topics we really try to expound upon in It’s Easy Being Green When You Have No Choice. Yeah, yeah. Give out the website again. Yeah, I think the best way you can view a trailer as well we’ve got many great experts who have weighed in on this with more degrees than thermometers in terms of their academic backgrounds and then just a click to buy at Amazon. Just go to GreenFlick.com, Jason. It’s funny that you live in a place like San Francisco. I mean, is it possible for guy like you to have any friends there? You know, the neat thing is, I guess, at any particular location there are some wonderfully right minded individuals, but I gotta tell ya, we are certainty the minority, there’s no question about that. I mean, the left isn’t wrong on everything. I like some leftist ideas, actually, but just this whole thing about restricting freedom and capitalism, I mean, what it does, it ultimately, it hurts the poor. All of these policies hurt the people they say they’re going to help. They’re pretending they’re helping them and I don’t know if it’s unintended consequences or just, you know, planned. Really, just a conspiracy, you know? But, all these policies ultimately hurt the people they say they’re trying to help. That’s who hurts the most. I mean, do you think Al Gore is hurt by any of these, say he didn’t profit from the environmental movement. Say he wasn’t selling carbon credits, you know, he wasn’t selling his movie and his book and all of this kind of stuff and doing speeches for absurd speaking fees, traveling around on high carbon footprint private jets, living in his Tennessee mansion, and I’m sure he has many other homes around the world, you know, with his $1,2000 a month electric bill. Let’s just say, none of that, just the fact that you’ve got this situation where it doesn’t hurt someone like him, like it hurts people in developing countries. It hurts the poor in American when they put a bunch of restriction on everything and the price of gas goes up. I mean, that doesn’t hurt people like Al Gore at all. See, what they plan to do and this is the whole model of sustainable development – you’re right, ultimately it does hurt especially those on the lower end, but their plan here is to tax us to death with carbon credits and charge us with various fees, etc, so that we’ll be able to pay for other’s, for example, electricity use to subsidize their use of vehicles, which will ultimately mass transit, to subsidize their housing which is going to be demonstratively more expensive because of all the environmental regulations. You just look at the city of Palo Alto where Stanford is located here in the San Francisco bay area. Palo Alto, before you even break ground on a house, the environmental thieves that are paid to the city for your average 3,000 sq ft house are going to run you about $60,000. That’s money that’s just given to the government for their various social programs. I had Thomas Sowell, I guess is how you say it, you know, he was on the show and on that show and my discussion with him, I actually coined the term, so you can use it, okay, I coined the term environmental racism, because what happens is all of these restrictions like the $60,000 to start, before you can do anything in terms of building a house in Palo Alto or all of this dedicated open space, all that does is keep the poorer classes out. This is got to be intentional. Isn’t the point of, you know, when I lived in New Port Beach, okay, there’s this big open beach area, it’s called Crystal Cove and it’s dedicated environmental, no developer, God forbid, can ever build there, but isn’t the whole point of this egalitarian movement is that you want to share everything and have everything be opened to everybody? Well, you don’t see people who live South Central LA being able to afford to live in any of these neighborhoods where the likes of Al Gore live. I mean, don’t they want to share? No, they don’t want to share. They want to control. They don’t want to share, they want to control. That’s where we are today with the elitist class that says they care about the middle class when in fact they want to squeeze the middle class, create a one-size fits all class with, again, room for them at the very top. There’s so many hypocrisies and so many holes in the theories, it’s just, it’s just ridiculous, but hey, thank you so much for sharing this stuff with us today. Just any closing thought you want to give without me interrupting ya? Jason, listen, I really appreciate guys like you and your voice and your quest for the truth. We need to follow the truth where every it leads and again, just tagging on, you know, what you said at the very beginning. This is like religion, the two sides are so polarized, but I’m just hoping that as people do their own research with an open mind, they’ll begin to see the truth in this particular case and this is so important it needs to be stopped, because it will be the fundamental transformation of not just this country, but the world unless checked and that’s what we’re hoping with this film that it will be a source of inspiration and get people active to go out there and do something about it in their local community. Yeah, good stuff. I like what you said, follow the truth wherever it leads, whether it agrees with what we’re thinking and saying now or something in the future with new information. The Truth is the truth. It’s not a vote. The science is science. Period. Brian Sussman, thank you so much for joining us. Jason, all the best to you. Thank you very much.